In improv, we try to respond to invitations with, "Yes, and" rather than, "No, but." The Creativity Project is full of, "Yes, and," responses. I love this book for both its actuality and its possibility. It is an ongoing conversation with a community of creative people. But it also provides an explicit invitation for each reader to join that community. The first section is composed of prompts and responses and the second section is full of responses that are open invitations to the reader. But the entire book can serve as inspiration to the reader. "I am stuck! I am stuck!" I am the worst writer in the history of the world? What do I do? Where do I begin?" Relax-- just randomly grab two book. Open the first book to any page and use the first sentence on that page as the first sentence of your story. Then open the second book to any page and use the first sentence on that page as the last sentence of your story. Now, start writing to make those sentences fit together." 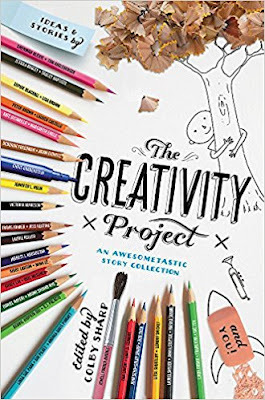 This book does a good job capturing the sense of play and exploration that every creative artist must have in their tool kit in order to create new projects.